Catching up on my local blogs this weekend, my jaw hit the floor when I saw a post over at the Food Fight Blog reporting that Kalga Kafe had closed. I can’t tell you how sad this news is to me. 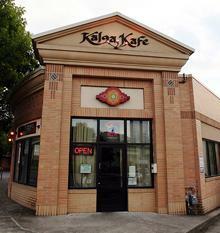 Kalga Kafe was one of my favorite restaurants in Portland. Kalga wasn’t the fanciest of places, and it was often overlooked in the crowded Portland restaurant scene when it came to accolades. But I adored it. It’s a place which will always hold many fond memories for me and I’ll forever miss Sukhdeep’s phenomenal Indian food. Kalga Kafe would have best been described as eclectic, it was one of the only places in town with Indian, Thai, Mexican, Japanese, Mediterranean and Pizza all on the same menu (and all served very well). Kalga’s owner Sukhdeep Singh had a deep commitment to the food he served and the community which surrounded the restaurant. The cafe was maintained as a highly sustainable business using mostly fresh, organic and local ingredients. It’s an extremely sad day when such a fundamentally good place like Kalga Kafe closes. ed note: Looks like Sukdeep is moving to brazil. This is indeed sad. While I have not eaten there in a while (since moving to the country), the times I did eat at Kalga were enjoyable both in atmosphere and food. As a former SE PDXer, I was glad to have such a high quality restaurant in the area. It's really too bad they had to close. Deepee come back to your true home. BURKE!!! I was also saddened to hear that the Kalga is closed. I drove by the other day and saw plastic over all of the windows. I hoped perhaps they were just painting, or maybe they relocated. I wondered to myself why such a fantastic place could be closing. Was it the economy? Did the owner just relocate to another city? I am need of another favorite restaraunt now. Very sad!!! So…the prodigal son is leaving Portland. This guy is a train wreck of a restaurateur and child. He took his parent's retirement money and mislead them into believing he was capable of running a restaurant. He proved that he wasn't to be trusted as an overseer of his parent's golden years or as a general manager/ chef. I have no documentation that suggests any experience in the food service industry prior to his railroading his naive parents into throwing their money away. Shame on you.